Back to Pinnacle again for another really inexpensive but fun break. Yes, yes, I keep going for this product even after all these years. It's just that good! This product has been a joy to open and I'll gladly keep purchasing these for a break that I know will be good. 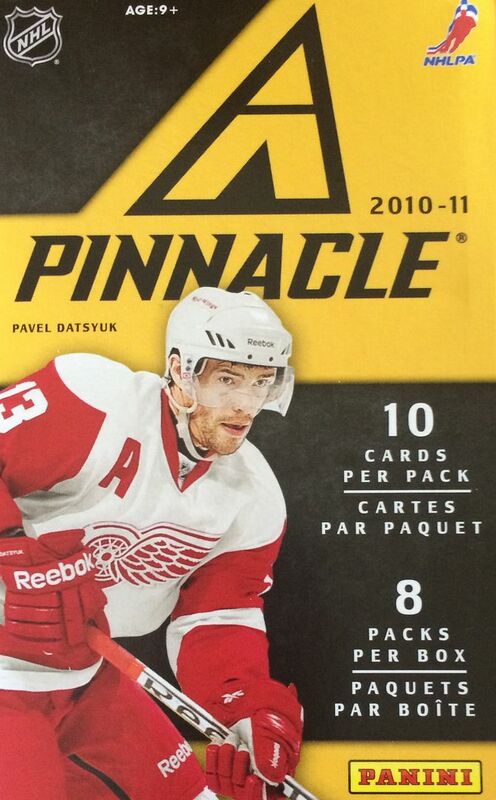 It's been a couple years now that Panini has left the hockey card market, but Upper Deck hasn't come up with anything in retail like what Pinnacle (and other brands like Donruss and Zenith) has done. Pinnacle was able to cram in one jersey card per blaster. Looking at Upper Deck products, there just isn't anything that has a hit per little retail box. It's just not available! And Panini was able to do it a very reasonable price. Oh I long for those few years ago when hits were available a retail at such a sweet clip! This blaster gave me a nice amount of thrills for the money. For ten dollars I got nice player photographs, a couple of rookies, some Nufex cards, and a hit. It's hard to beat that kind of a haul these days. Though I've seen a lot of Pinnacle cards come through my hands, they never cease to impress me with their uniqueness. The pictures are so much fun! And the Nufex cards look great. The Nufex foil is very well done and gives the cards a unique look about them. It would have been an awesome parallel set to try and complete. The only downer with this break were my rookies, which weren't the greatest. But with everything else, I can't complain! This is the kind of photo that makes Pinnacle a special product. 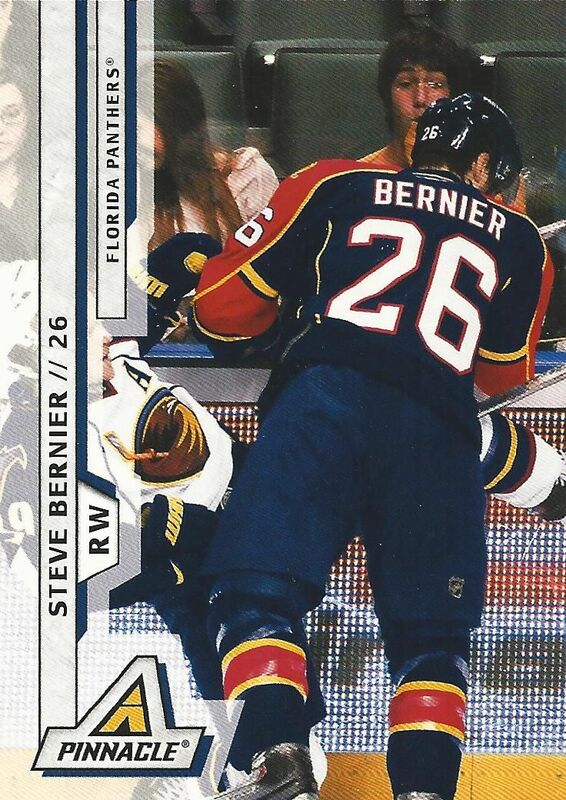 Sure, you don't see any of Bernier's face, but you see what he just did and the reaction of the fan behind the glass! Such a great look of surprise! Argg! The only thing I don't like about the Nufex cards is the way they scan. They are terrible cards to put in a scanner. Be assured, this card looks a whole lot better in person than it does from my scan of it. 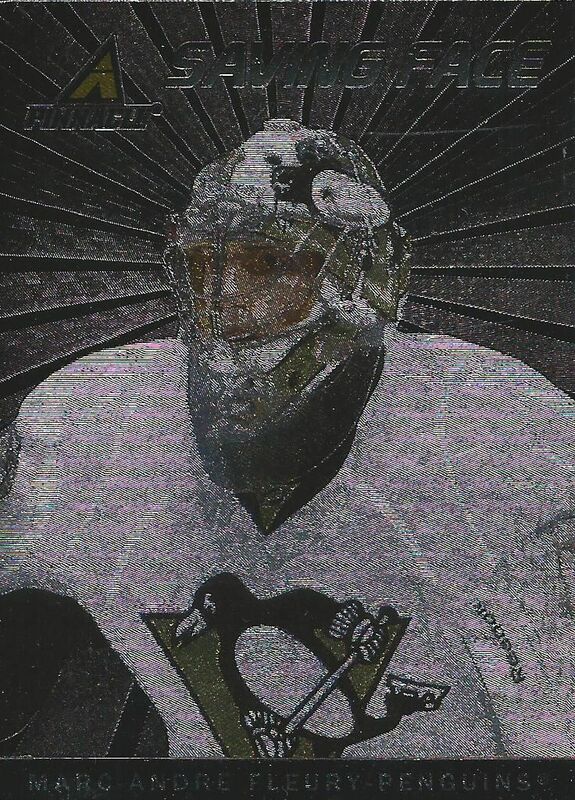 I have actually pulled this Fleury Saving Face card a few times now. It's following me! 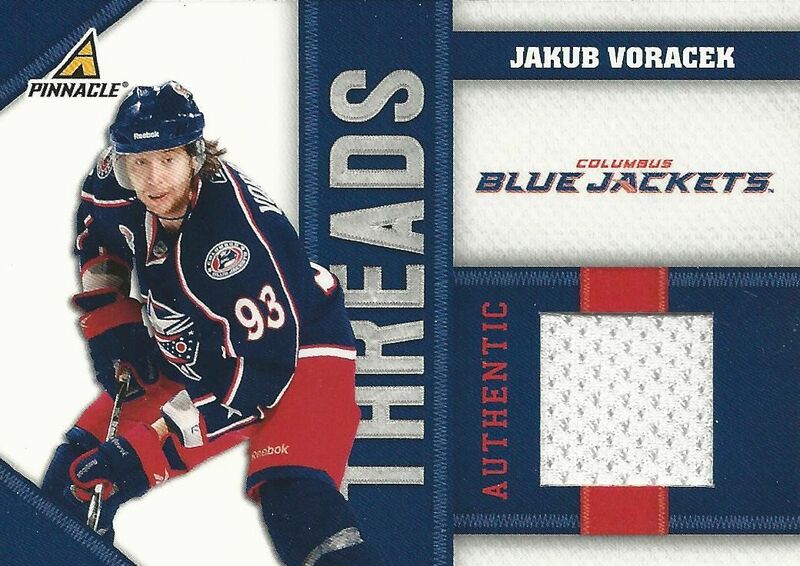 Threads were a jersey insert set that had a very clean, but interesting design. I just love how all the lines on the card come together in harmony. It's a very well-balanced design that elevates what would be just a regular jersey hit. I'll always recommend getting Pinnacle if you can find it for the price I got it for. It's a break that I think most collectors will really enjoy. You get fun stuff starting from the base cards all the way up to the hit of the box. Grab a blaster today!